Hi, hope you had a lovely summer break. Well it’s that ‘Pilates’ time of the year again. Class level I-II restarts Tuesday September 8th at 7pm and class level II-III on Tuesday 1st September @ 8:15pm in the GAA Club Monageer, €70 for 7 week course. Text me to book your place and time (beginners at 7pm and stronger class at 8:15pm). Thanks Jane Kennedy 087-2724506. The Junior A Camogie team’s match scheduled for Monday 31st August will now be played on WEDNESDAY 2nd September at 7pm in Castletown. All support welcome. 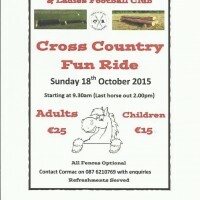 There is a gate fee of 5 euro per adult and under 16’s are free.